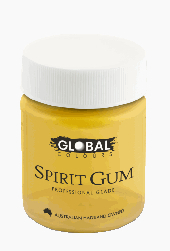 One 45ml pot bottle of top quality spirit gum, perfect for use to create a variety of special effects, including attaching facial hair and prosthetic appliances. May be used to glue on facial hair and prosthetic parts such as noses and brow ridges. Perfect for use with latex pig snout, witch nose, slashed wrists appliances sold separately.